Win access to the CrossOut beta. CrossOut is a massively multiplayer action game that lets you build battle machines out of the detritus of the post-apocalypse. Build your own unique vehicle and ride it into battle against other players. 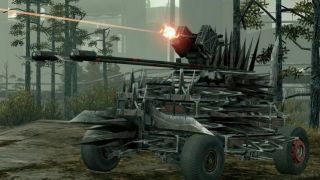 There are thousands of possible combinations, and CrossOut's damage modelling system will let you blow them up in creative ways using chainsaws, power-drills, rocket launchers and more. How would you like to play? You can gain access to the closed beta for free by simply entering your email address into the widget below. Next week 750 keys will be raffled off to entrants. With a bit of luck, you could be starting your journey through the war-torn post-apocalypse in no time.